This is less of a recipe and more of a combination of healthful ingredients, inspired by a feta cheese and field greens salad that I ate a couple of weeks back at a friend’s wedding. Being the cheese hater that I am (pardon me cheese lovers! 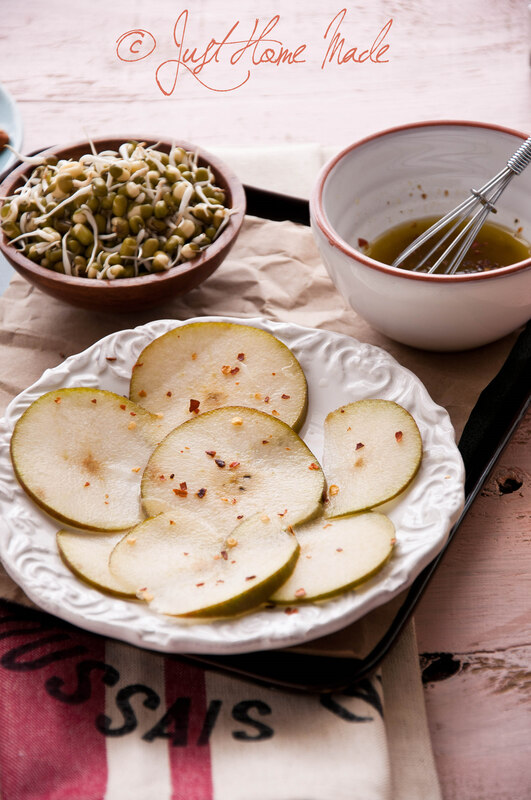 ), I adapted it to suit my taste by swapping cheese with my favorite sprouted green grams and including pear, the autumn fruit. I find sprouting – every aspect of it from cleansing the seeds, to draining the excess water, to wrapping it in wet cloth, to providing the right environment, to be deeply satisfying, almost meditative. There’s something so magical about sprouting where in we get to witness nature’s most basic visual proof of life and a symbolic of the circle of life in its simplest everyday form.. Through germination, a dried legume acquires such superior nutritional qualities that it transforms itself into a wonder food of sorts in just a matter of couple of days. 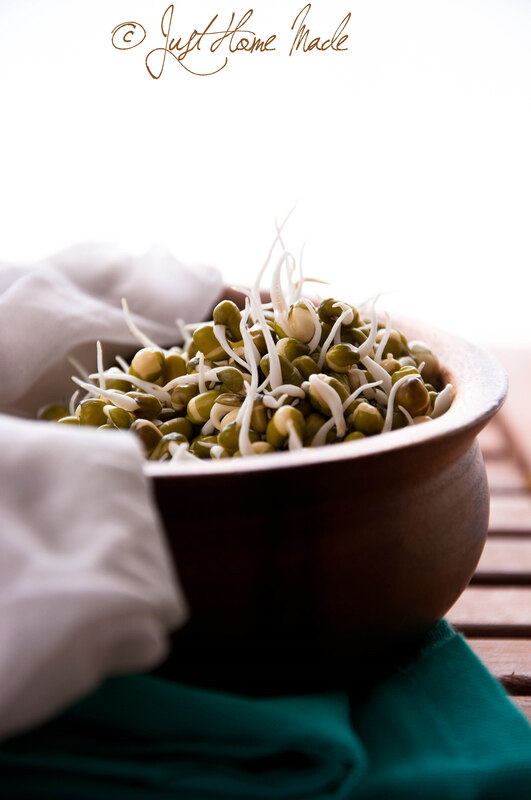 No wonder then, sprouting increases the protein content of green grams (or pulses in general), which propels them to come very close to a complete protein as compared to what they are otherwise. It also reduces their flatulence causing properties and are better digested when compared to their raw form. Sprouts contain much chlorophyll and are best consumed fresh than cooked. You see why sprouts would make an excellent addition to your diet? May be this is the reason why in most parts of South India, green gram is the legume of choice introduced as the first of solid foods in the form of cereal for babies. One of my other favorite uses of green gram is in ground form – it is an excellent natural soap for face and body which keeps skin soft and supple without any dryness. For the same reason, it is used for bathing just born babies and yes, I have used it for my little girl too! Spiced pecans and cranberries give this salad a much-needed twist from the usual. Tartness of the cranberries, freshness and crunch of the sprouts, spicy bite of the pecans and mellow sweetness from pear along with lemon juice and spices makes this salad quite unique. 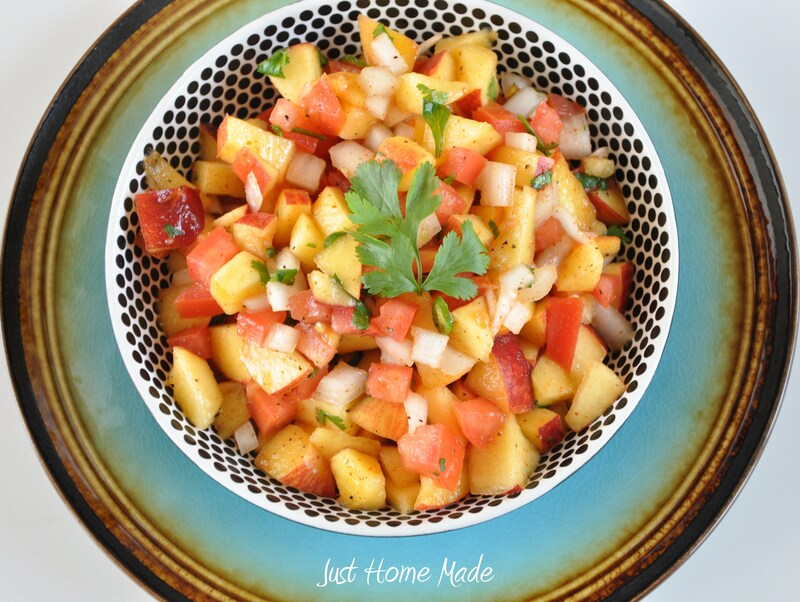 With pecans and pears, this salad screams ‘autumn’ from the rooftop. Pomegranates are in season, so you could experiment with the red rubies as well. 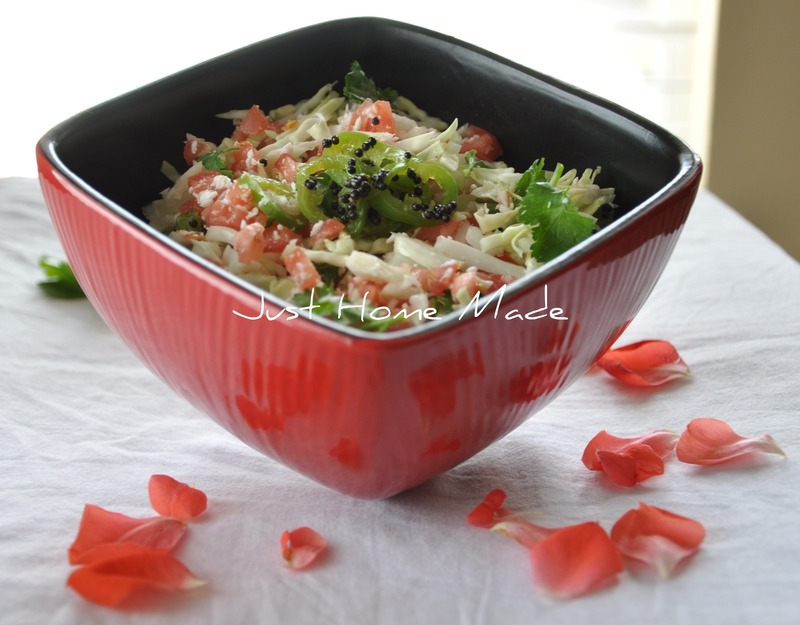 Alfalfa might make a great substitute too, I’ll have to try it next time..
How do you like to eat your sprouts? Wash the green gram well and soak overnight in plenty of water. 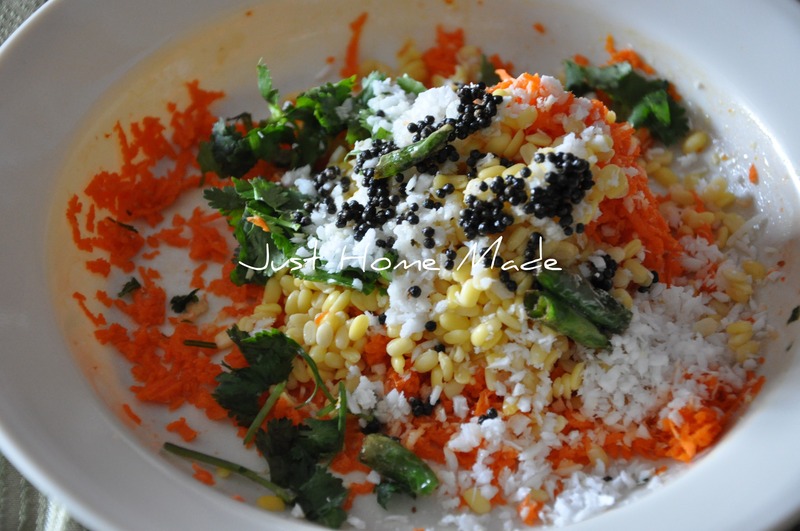 Next morning, drain the water and wrap the soaked green gram in wet paper towels or soft cotton/cheese cloth. Keep it in a big bowl, cover and let sit in a draft free area (neither chill nor hot) for a day or two until well sprouted. To roast the pecans, microwave in 30 sec intervals for about 2 mins and let cool. Once crisp, add a drop of oil, paprika and salt to taste and toss to coat well. I prefer to crush the sea salt in a mortar and pestle as it is slightly coarse. For the dressing, whisk in equal quantities (or to your taste) of lemon juice and EVOO along with ground black pepper and red chilli flakes. Toss everything together with the dressing, salt, roasted spiced pecans, cranberries and serve immediately. im nuts about nuts in salads!! this is all of autumn wrapped together in a bowl! sooo good and crisp! You don’t like cheese?? 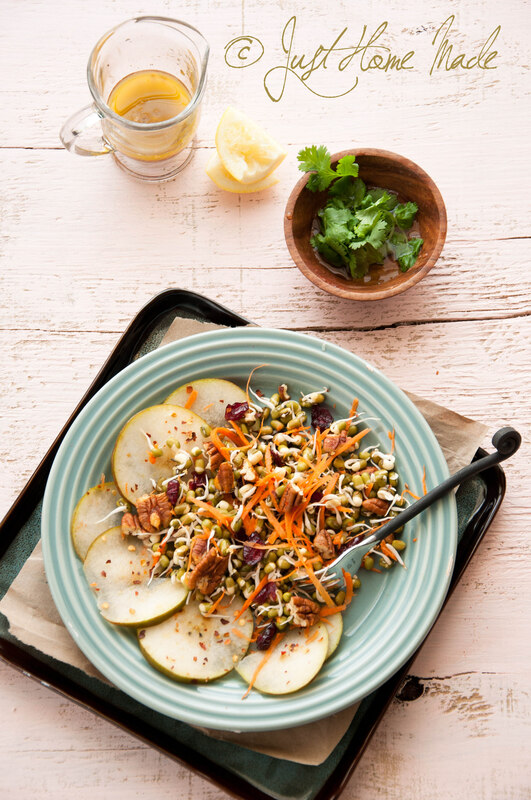 I love it and actually wear it on my waist :)) Sprouts are a favorite with me too and the addition of spiced pears and pecans must make this a gourmet salad. Envy you for having easy accessibility to all these! And as always, beautiful pictures! Kankana, as much as I hate to admit, it is Yes! As always Radhika, a beautiful post! 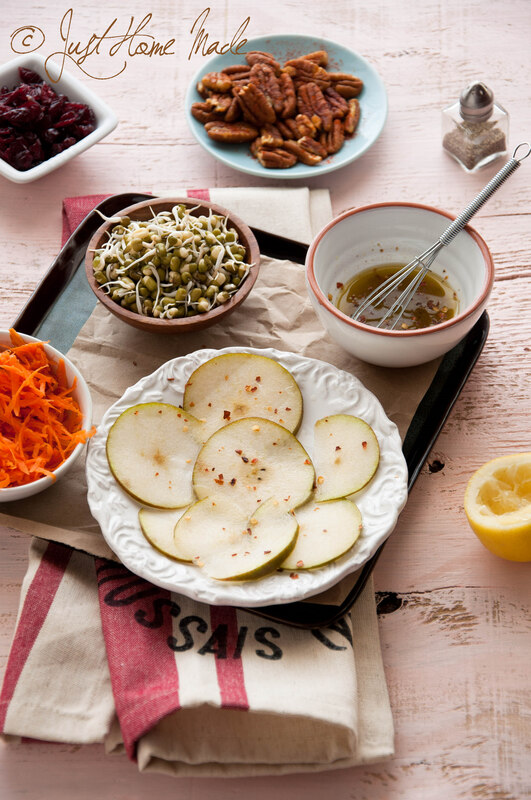 I’ve never heard of gram, but this salad looks wonderful, and I love anything containing pear. 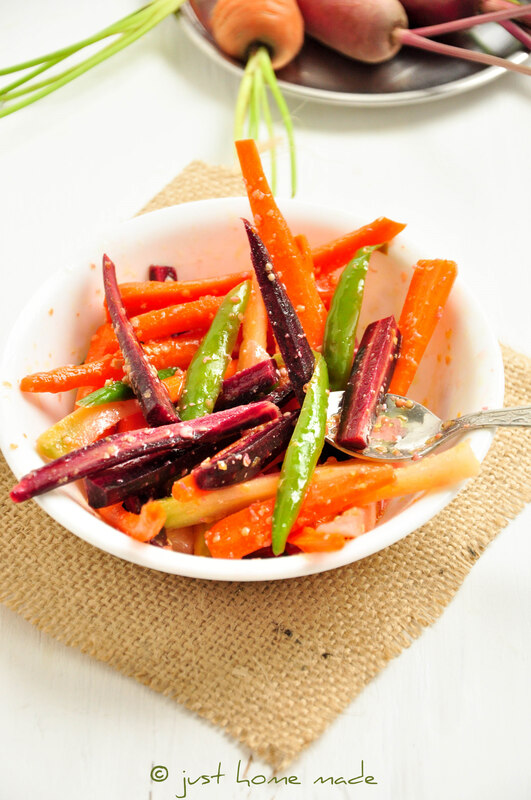 It’s such a wonderful addition to salads, isn’t it? Green gram is the most commonly sprouted legume in India. I’d say as popular alfalfa here is..
Like you, I’m not a big fan of cheese 🙂 The salad looks gorgeous, never tried pairing pears with bean sprouts and nuts. Usually make a stir-fry out of sprouts and occasionally use it in salads. Those photos are oh so beautiful! I’m a big fan of cheese! The salad looks absolutely delicious! Lovely clicks radhika! 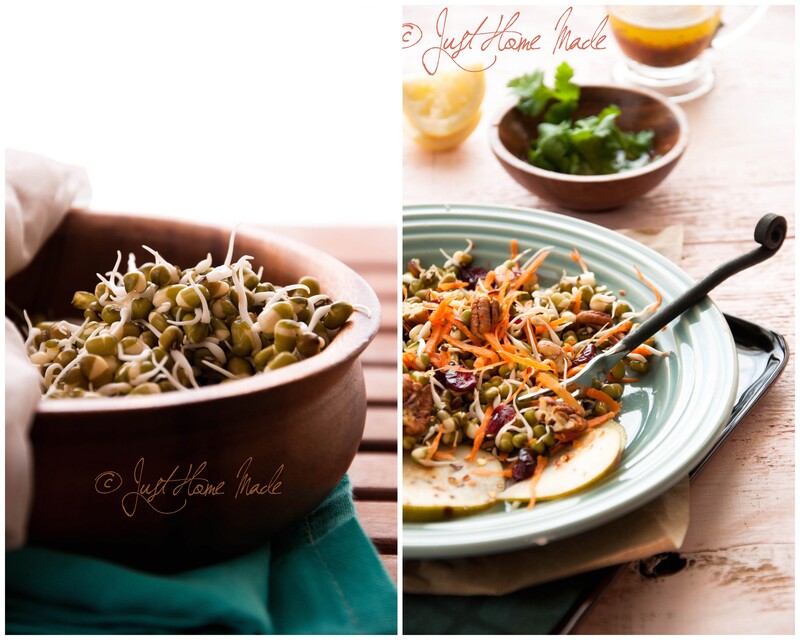 I don’t think I ever had green gram, but I love using sprouts in my salads. And the pair, such a delicious addition. Thank you… It is people like you who come about and reassure me with your sweet words that make this blog worth a happy pursuit.. This looks so delicious and the photography is amazing.